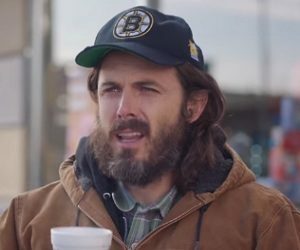 Casey Affleck stars in a parody of a “real” Dunkin Donuts customer on Saturday Night Live. The spot features several people introduced as real Dunkin Donuts customers who are telling you why their holidays run on Dunkin. While a young woman says that all she wants for Christmas is a Dunkin Pepper Mint Dunkaccino, another one says that with the Dunkin app she can order and pay on her smartphone, so her coffee is waiting for her when she walks in. Affleck, who stars as Donny, says that he “f.ing” loves Dunkin. “You want to talk to real customers? Yo, that’s me. I’m the Mayor of Dunkin. This is the face of Dunkin Donuts right here”, says the actor, while holding his left hand, with a cigarete in it, outside a sliding door, and arguing with a Dunkin employee that he’s not smoking inside. The voiceover mentions that with Dunkin Rewards app there’s even more reason to celebrate the season. “Yo, free coffee”, shouts Donny, adding that he’s got the big one. “I got a free coffee right there on the app”, adds, showing the broken display of his smartphone to the camera, to prove he’s not lying. He then introduces his buddy Dewey, whom he laughs at, by asking him to tell how he likes the vanilla nut taps. They get into a sort of scuffle resulting in boxes falling to the ground and lots of noise.